By ignoring gender issues, historians have failed to understand how efforts to control women—and women's reactions to these efforts—have shaped political and social institutions and thus influenced the course of Russian and Soviet history. These original essays challenge a host of traditional assumptions by integrating women into the Russian past. 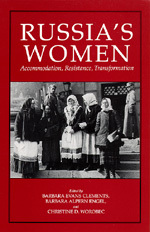 Using recent advances in the study of gender, the family, class, and the status of women, the authors examine various roles of Russian women and offer a broad overview of a vibrant and growing field. Barbara Evans Clements is Professor of History at the University of Akron. Barbara Alpern Engel is Associate Professor of History at the University of Colorado. Christine D. Worobec is Assistant Professor of History at Kent State University.